DIFFICULTY: All the way is paved and the steep sections are all equipped with conventional stairways. It is conceived and prepared as a tourist-panoramic route. The total incline is 536m. 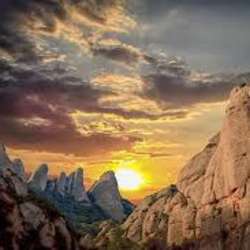 INTRODUCTION: As many of you may already know, Montserrat is the holy mountain for the Catalans, as the Virgin of Montserrat is the Patron of Catalonia. Beyond this symbolic importance, the mountain offers a unique hiking experience thanks to its strange shaped rock scenery which we can enjoy all the way up and down. The hike starts by doing the tour of the eastern edge of the Montserrat range, with views of the Llobregat valley until the sea, and to the St. Llorenc del Munt range with its iconic “La Mola peak”, which some of us already know ;) All the path is very easy to walk and shadowless, but quite steep in two sections. After 30 or 40 minutes we should arrive at the “Pla de les Tarantules”. From then on we walk “inside the range” with views of Montserrat rocks in both sides. We closely pass by some of the climbers favourite areas and easily understand why it is considered by many as a climbing paradise. The trail is quite flat until the end, where it starts going uphill, but with stairs, so to make it “tourist friendly”. When arriving at St. Jeroni Peak –the highest point of Montserrat- we can contemplate the view over the whole mountain range and its “Agulles” (needles) –the singular rocks at the opposite edge of the mountain-. The way down we walk through the same trail, though in case many people are interested, there is a more direct stairway to the Abbey, a shortcut through the forest to enjoy a different hiking experience. ALTHOUGH IT IS POSSIBLE TO BUY ALL SORT OF FOOD IN THE ABBEY AREA (SELF-SERVICE BAR&RESTAURANT AND SMALL SUPERMARKET) I RECOMMEND YOU TO BRING A “PACKET LUNCH” TO SAVE MONEY AND SO WE CAN ALSO STOP FOR LUNCH AT ANY POINT OF THE HIKE. Once back to Montserrat Abbey, you have the opportunity to visit the Abbey and some of its museums. From that point on, we can split according to the different preferences.